For her exhibition at Rond-Point Projects Rachel Levine will show a series of new works developed whilst on residency at Triangle France. In partnership with Triangle France and Glasgow Sculpture Studios and with the support of Creative Scotland. 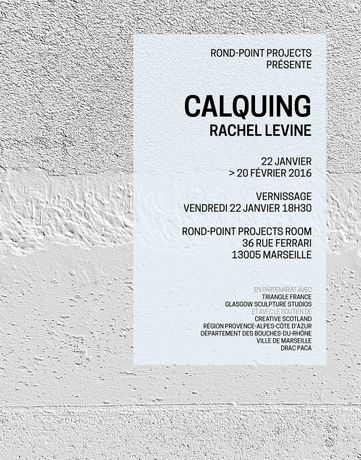 The title for the exhibition, Calquing, is derived from the English linguistic terminology for a loanword translation, a word or phrase borrowed from another language which is translated into a literal equivalent within the target language. The word is in and of itself a calque from the French verb Calquer (to copy). Levine’s interest in the word is in its multiplicity of meanings, the confusion created in its unsettling in-betweeness. Within these multiplicities the title comes to represent the process and materials used in the creation of one of the major pieces for the exhibition, a series of transparent glass casts made specifically for the gallery space. The title also refers to the way in which the works themselves are utilized as a calque for language itself through the translation of the ineffable into a material vocabulary. Through this material vocabulary Levine attempts to expose the experiences of certain psychological and affective states and their influence on our perceptions of our surrounding environments. Rachel Levine employs the processes of sculptural production as a not only the medium for her work but also as its conceptual underpinning. Often working with casting and replication processes Levine is interested in transforming the image and materiality of an object as way of interrogating psychological perceptions and affective states. Rachel Levine (b.1988) lives and works in Glasgow, Scotland. She graduated from The Glasgow School of Art with a BA in Sculpture in 2013. Her recent solo exhibitions include Soft Chaos at The CCA Glasgow and Material Anxiety, Café Concrete at The Hayward Gallery in London. Her group exhibitions include Fold Up Snap On, The Pipe Factory, Glasgow, Vernissage, The Royal Standard, Liverpool and New Contemporaries at The Royal Scottish Academy in Edinburgh. Levine was artist in residence at Triangle France from September to December 2015; past residencies include The Banff Centre, Canada and The Scottish Sculpture Workshops.